The magic of alkaline-earth atoms lies in their electronic structure: the spins of the two valence electrons can be oriented parallel or anti-parallel, giving rise to a set of singlet states and a set of triplet states. These two sets are connected by narrow transitions, which are employed in optical clocks. The lowest states of the triplet system are metastable, having lifetimes that can exceed all other relevant timescales. 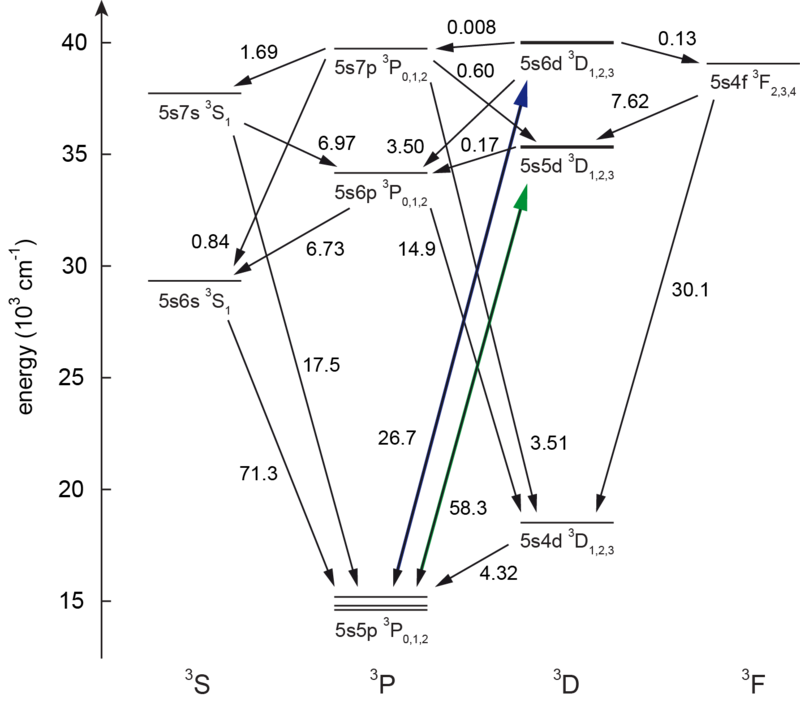 Various dipole-allowed transitions originate from these metastable states and can be employed for cooling and trapping of the atoms, as well as for optical pumping within the various metastable states. So far, comprehensive spectroscopy of these transitions has been performed only for a few specimens. 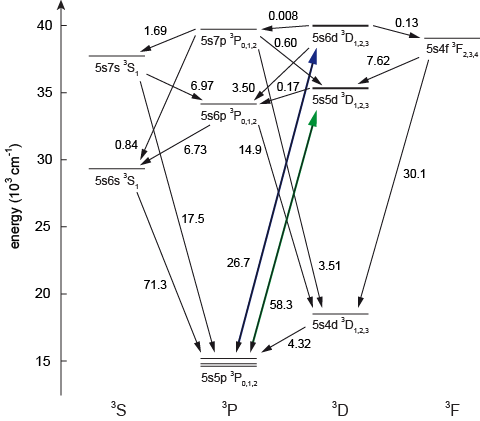 Figure 1: The level scheme of strontium shows singlet and triplet states. The transitions investigated here originate from the lowest triplet states and have wavelengths of 403 and 497 nm. 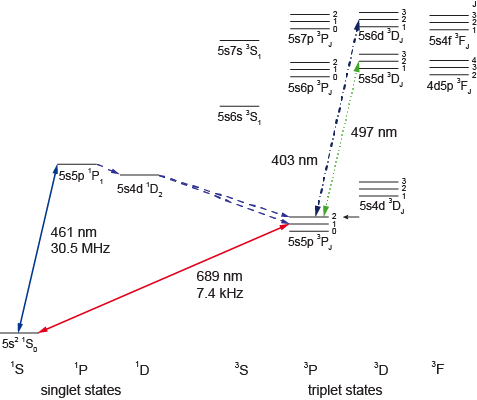 We developed a technique that allows us to significantly improve previous schemes of spectroscopy of dipole transitions within the triplet system. Rather than performing the spectrocopy with atoms held in a magneto-optical trap (MOT), we accumulate and store atoms in a magnetic trap. This trick allows us to populate the magnetic trap with only the specific states of interest, increasing the signal strength by orders of magnitude. Two complementary detection schemes are demonstrated as well. We call this technique "reservoir spectroscopy", because it utilizes atoms that are stored in our reservoir, the magnetic trap. We use the element strontium for our experiments, but the same technique can readily be used for all other elements possessing metastable states with nonzero magnetic moment. For states that cannot be trapped by magnetic fields, an optical trap can be used. We demonstrate our new spectroscopy technique on two transitions, having wavelengths of 403 and 497 nm, respectively. The fine structure (and even more so the hyperfine structure) of the states involved splits the transitions into many individual lines, and we determine the absolute frequencies of about 70 transitions with an accuracy of a few MHz. The frequency of the spectroscopy laser is monitored by a wavemeter, and the wavemeter in turn is constantly calibrated by laser light referenced to well-known transitions in various atoms and ions. 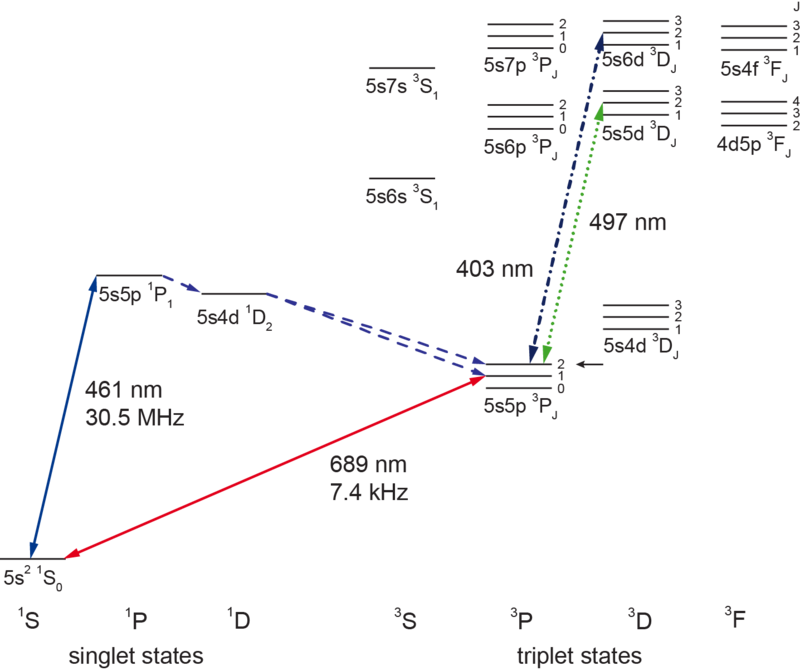 Figure 2: A typical scan over one of the transitions, showing the resonances of the three bosonic isotopes (left), as well as the hyperfine structure of the fermionic isotope (right). We also ask ourselves the following question: "If we excite an atom into one of the higher-lying triplet states, into which of the three lowest (metastable) states will it decay?" This is an important question, as many new and interesting proposals suggest to use these excited states for sophisticated schemes of quantum simulation and other experiments. The question is not trivial to answer, as a multitude of pathways need to be considered (see the figure below), and many states are very close to one another in energy, such that photons from the environment's black body radiation can transfer population between adjacent states. We perform detailed calculations and use different experimental protocols to quantify the probability of a few relevant pathways. This allows us to compare various transitions with respect to the efficiency of optical pumping. Figure 3: After excitation into the 3DJ states (green and violet arrows), atoms can follow various pathways to return into any of the three metastable 3PJ states.